Home > Free > Vaseline Coupon + $50 Dollar General Giveaway! Vaseline Coupon + $50 Dollar General Giveaway! The weather is getting cooler and my skin is already getting more dry. Surely I’m not the only one! Dollar General and Vaseline want you to have soft skin every season. I like to use Vaseline Intensive Care lotion because it keeps my skin softer for longer than a lot of other lotions. Vaseline is made to keep your skin healed, but just how powerful is it? It’s been put to the test in the driest regions of the U.S. to prove no matter where you go; you can still enjoy healed skin during the transition from fall to winter. And now you can find it for an affordable price you’ll love at Dollar General. 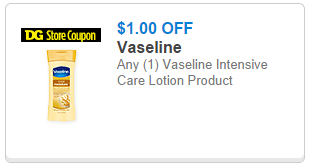 Get a $1.00 off Vaseline coupon good on any Vaseline Lotion and stay healed with Vaseline. Ready for a challenge? Use your $1 off Vaseline lotion coupon at Dollar General right now and tweet using #DGSoftSkin telling me how Vaseline has helped your skin survive this drier weather. One Southern Savers reader will win a $50 Dollar General Gift Card. You have two ways to enter, feel free to enter with one or both. 1. Leave a comment below telling me how Vaseline has helped you survive the dry weather. 2. Tweet your answer using #DGSoftSkin and leave a comment below telling me you have.